Giorgione, Portrait of a Man ('Terris Portrait'), 1506. Titian, Jacopo Pesaro Being Presented by Pope Alexander VI to Saint Peter, 1508–11. Oil on canvas. 147.8 x 188.7 cm. Koninklijk Museum voor Schone Kunsten, Antwerp Photo © Royal Museum for Fine Arts Antwerp / www.lukasweb.be - Art in Flanders vzw. Photography: Hugo Maertens. The word Renaissance is well known by the public, and usually refers to the artists supported by the Medici family in Florence: but during the first decade of the sixteenth century in Venice, this pivotal historical artistic period began branching out with innovative painters such as Giovanni Bellini (c. 1430-1516), Sebastiano del Piombo (c. 1485 -1547), Tiziano (c.1488 / 90-1576), Lorenzo Lotto (1480-1557) and the young Giorgione (Giorgio da Castelfranco1478-1510). The exhibition: In the Age of Giorgione, brings to the light some art works by the painters mentioned above—among others—who lived in Venice during the first part of the sixteenth century. 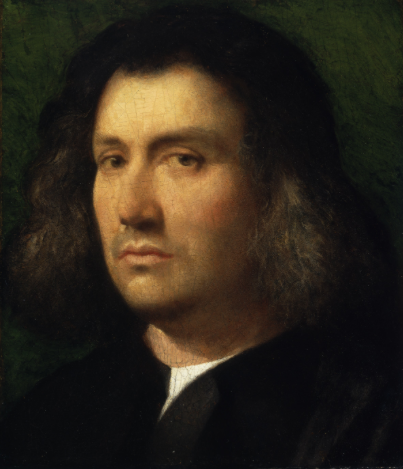 Giorgione's artistic career was interrupted by his death at the age of thirty-three, but the importance of his legacy is priceless: Titian was largely influenced by the intimate approach of Giorgione's portraits. In the first room of the exhibition the painting ‘Portrait of a Man’ (c.1506) (also called Terris Portrait, after his old owner), is the result of a careful study by Giorgione of Giovanni Bellini. Leonardo (who arrived in Venice at the beginning of the sixteenth century) and Albert Dürer’s works are also shown — the painting ‘Portrait of Burkhard of Speyer’ stands out, and is dated to the same year as the aforementioned ‘Portrait of a Man’, completed in 1506. A second portrait exhibited here, and attributed to Giorgione (from the Scottish National Gallery), is ‘Portrait of an Archer’. The debate surrounding this attribution has been quite controversial, and the delicate condition of the painting is not helping to resolve the problem. In the famous book ‘Le Vite’ (1550) Giorgio Vasari wrote about the Portrait of an Archer, "in it we see eyes turned in such a way that Leonardo da Vinci or Michelangelo Buonarroti would not have painted them otherwise." This young man is talking to us, he had just turned his face towards us and the painter caught the exact instant in which he was looking at him: moments you would usually associate with a picture taken on camera. His hand is resting on his chest, and shows details of the history of costumes: a grey glove with the thumb and forefinger cut off so he could use use the arc of his hand, or read a book without taking his gloves off; like in the painting of ‘Man with a Green Book’ (1510-15) attributed to Giovanni Cariani. A great novelty of the exhibition is its careful reconstruction of those few years of Venetian painting, considered among the most interesting of the Italian painting of that period. 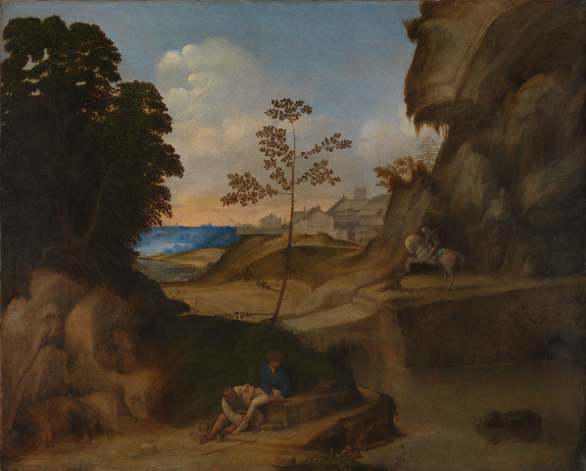 It is the birth of the landscape as a genre, in which Giorgione played a key role. In the section, 'Landscape' there are exposed: a watercolor by Dürer entitled 'Watermill' (1494-95), 'San Girolamo' (c. 1506) by Lorenzo Lotto, and the enigmatic 'Landscape Il Tramonto; (The Sunset 1502-04) by Giorgione. The meaning of this painting by Giorgione, entitled by the art historian Roberto 'Longhi Il Tramonto' (The Sunset) after the equally mysterious painting 'La Tempesta' (The Storm), remain unknown. There have been many interpretations of it based around the myth of Philoctetes, but none have been confirmed. A certainty is that the chromatic classicism of this canvaswas absorbed by Titian in the years ahead, as stated many times by Longhi. Another section of the exhibition are the devotional works, such as: 'Virgin and Child' (1500-05) attributed to Giorgione, in small format because addressed to a private devotion. 'Jacopo da Pesaro Being Presented by Pope Alexander VI to Saint Peter' (c.1508-11) by Titian: where Peter is sitting on a throne decorated with a relief representing the triumph of Christianity over paganism, in reference to Roman classical culture; as well as 'Virgin and Child' (1505) by Giovanni Bellini, to name a few. The last room is dedicated at the Allegorical Portraits. In this section we have the only sculpture on display, carved in alto rilievo: 'Bacchus and Arianide' (c.1510), a young couple of a classical and sensual beauty, by Tullio Lombardo. Also here we find the painting 'La Vecchia' (The old Woman c.1508-10), by Giorgione - recognised as his mother- which is being exhibited in England for the first time. The woman is looking at us with her toothless mouth half open, as if talking. Her hand points to her chest holding a scroll that says: Col Tempo (With Time), she wants to alarm us: "Do not loose your time, you will be old like me soon!". And so ends, a cultured and fine exhibition, which teaches you how to look and read ancient painting and understand it through its evolution (the catalog written by Simone Facchinetti and Arturo Galansino is a must-have). In the Age of Giorgione, Royal Academy, The Sackler Wing of Galleries.